Is 'JM' Johann Maresch OR John Meir Pottery Mark? :- Hello! I have a decorative plate very similar to the one shown on your site. Above is a photo of the mark, which was very well described by "Denise", and of course I have sent a picture of the front side of the plate too. My guess is her description of the material is also good. I'm not much able to describe it since I'm Swedish and also since I just recently got interested in ceramic art beauties. The back is impressed J.M. Below it also a small circle with two 3/4 circles located at the top and bottom inside the outer circle." I would give the same description except for the number which is 5256 on my plate. Beside John Meir J.M. initials, I have also found a J.M. for a German - Joh Maresch, under this next link. Can you offer any help or give any comments on my plate? Roger, may I say you are a genius! I love it when things like this happen on this site! You have just solved yours and Denise's query (and probably many other visitors queries) in one go. You have also shed light on something we needed to know about about on this site - an important maker who is becoming very collectible and expensive. The mark is definitely that of Bohemian potter Johann Maresch, not Staffordshire potter John Meir. So my sincere thanks to you and for your eye for detail (the JM mark was buried amongst 19 other pages of jumbled marks on the 'Germany' section of the OldandSold.com website - (Aussig Joh Maresch) - such is their strange, rambling site. It was there for me and Denise to find, but neither of us did! That's what so fun about this site; we all learn together and share information. None of us are experts, but we can pool our little bits of individual knowledge together to become a powerful whole! I went to the link you mentioned above and then began to research this mystery JM maker using the techniques I describe on my page called how to value antique and fine china ceramics. 1841 in a place that was then Eastern Bohemia, later becoming part of Germany. The town is now called Ústí nad Labemunstarred being situated in the Czech Republic, very near the border with Germany and not far from Dresden itself. The sculptural artwork from this factory is frankly stunning quality. I am now a BIG fan of these wares. For example, I saw for sale for $1,025 USD a Terracotta Sculpture of a 'Cherub' signed Maresch C.1863-70 valued at $1,025 USD. "The young curly headed cherub is seated on a large rock with rocks and floral at the round base,intently studying an animal picture book with a pig pictured on one page and dog on the other. A raised "real" green lizard has crept onto one of the pages. A curved pine cone of sorts in one of his hands,his flowing robe draped across both shoulders and back. Very detailed sculpture in every aspect." I saw some very fine examples of high quality sculptural ceramics in their ranges. The odd thing is that they went onto become very famous for something which, here in the UK, we do not associate with high art (maybe you do in Sweden as you gave us 'The Smurfs') - the ubiquitous GARDEN GNOME! Originally pottery marked as B M, the company changed their incised marking later in the 19th century, C.1863 to JM (the co-founder died of TB). "Antique Johann Maresch terracotta gnome. 10½ inches tall and marked on the base JM 6763. US $ 513.00"
One story I heard was the company was eventually shut down by the communist regime because they did a sculpture of the President which he didn't like. Not sure how true that is. As I always say, I can’t value or authenticate, but I know what I like, and I like Johann Maresch and their story, so thanks again for bringing this to light for this website. I was for the first time in my life strolling around a fleemarket and happened to walk by this plate of Johann Maresh. It caught my eye so I just put it in my basket and payed a few swedish kronor. My second item bought for its beauty. If there will be an continuation of this new interest remains to be seen. 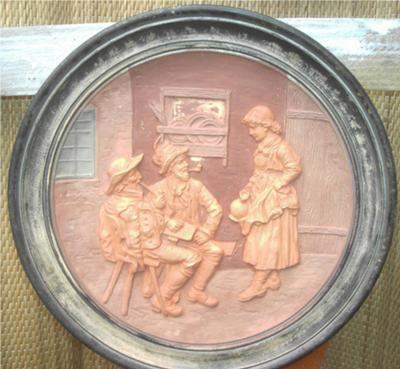 Last autumn your site helped me find information about a plate made in terracotta. Now I have found out that the artist behind the two small circles inside a big circle was Mûsterschutz, as can be seen i the foto I attach. 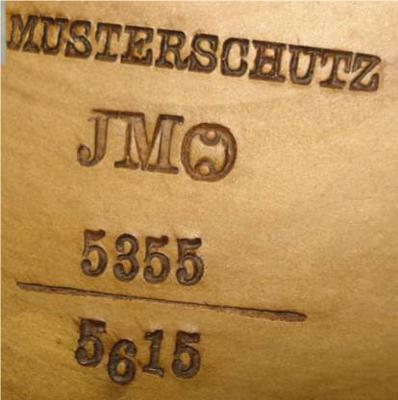 The name Musterschutz om JM objects comes along not only with the two small circles inside a slightly larger circle mark, but also with other mark. First, I understand JM stands for maker/"factory"
Then, is Musterschutz the artist/designer ? I belive it must be. And at last. Could the little mark/sign that comes along represent the sculptor or moulder or perhaps painter of specific object ? I am in possession of a wall plaque with the Mustershutz signature and sign (a circle within a circle) and wondered if it is the same as the one being discussed here? Does anyone know where I can go to find out its value or put it up for auction? Follow the links from there. I have 2 objects JM original, 92 and 95 cm. I have two antique vases (black with oriental decoration) with the mark JM 221 below, but there isn´t any other mark next JM. Can anyone tell me if this is probably a Johann Maresch work? Don`t get carried away trying to thing of meanings for the word `musterschutz` because all it means is that the style or pattern is protected - it means something akin to `copyright`. "Did J M use this clay because what i have researched they use exclusively IRON STONE ?" "anyone know"?? "Please"! "Many terracotta Tobacco figure humidors are being represented has this factory"! and sold has such. "Any Terracotta Austrian Humidor Knowledgeable Collector out there ?? ?.